The world holds dark assumptions that fervent dreams by different faiths for the Temple Mount (الحرم الشريف) must lead to conflict. We pretend that these dreams no longer matter, but past regional peace initiatives have fallen apart in disputes about the Temple Mount. "Whose Mountain is this? ", a street activity for the 9th of Av took place on July 20, 2010 -- click links for Ynet coverage [English] and interview on Channel Two, Israeli TV [Hebrew, scroll down for link]. Documentary film screening, presentation and discussion of God's Holy Mountain took place in Jerusalem on June 9, 2010 -- see details and picture album here. The Project's launching event took place on June 18, 2009. See Reuters' coverage as well as video available here. "A New Vision for God's Holy Mountain" was published in the Washington Post on June 10, 2009, available here. New article in October issue of Interreligious Insight. See our Press Release of the 3rd of March, 2010. The Role of the Prophet in Determining the Future Location of the Temple. To purchase prints or note cards, please email us at ohr@interfaith-encounter.org. An image of the note card is shown here. 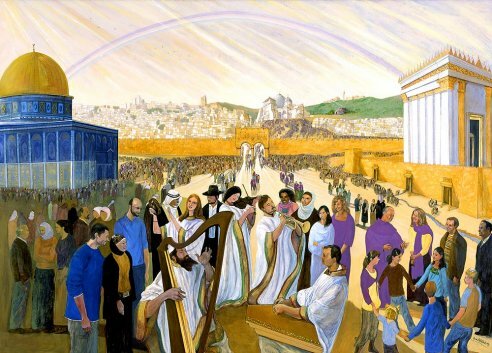 This is a vision about transforming the Temple Mount from a place of contention to truly God's Holy Mountain, a house of prayer for all people (Isaiah 56:7). It represents the prophecy of Zechariah 14:9 of the One God worshipped by the entire world in peace together. This vision is proposed by observant Jews based on background papers researched over five years. Of particular importance is one, published in Tehumin, the leading periodical of Jewish law in Israel, about the Role of the Prophet in specifying a precise location on Mount Moriah for a rebuilt Temple.